Shielddefense.net Redirect can appear in your Google Chrome browser after you install a potentially unwanted program (PUP) called Shield Defense. This PUP is supposed to provide you with a secure browsing and web searching experience but, unfortunately, it might actually pose a threat to your virtual security by presenting to you questionable web search results. Clearly, we cannot say that this is a major threat to your PC, but it is still possible that you might end up on questionable or even malicious third-party websites if you keep using this tool. Although our research did not confirm, it is possible that this extension is also distributed in bundled versions that may pack malicious software installers. This means that you may find more serious threats on board if this PUP is present on your system. We believe that it is best for you to remove Shielddefense.net Redirect if you want to keep your machine clean and safe. If you would like to know more about this potential threat, please go on reading our full report. There are two official pages where this PUP is promoted. First, the official webpage, shielddefense.net, which is not an ordinary page at all. In fact, it is not even a proper promotional page with all kinds of information about the tool. It is practically a search website that also happens to promote the installation of Shield Defense as a banner ad. If you click on the "Add to Chrome" button, you can directly install it. If you click on the "Learn more" link, you are redirected to the Chrome web store page, chrome.google.com/webstore/detail/shield-defense/eadnlkgpakfjkgpgndbpmenoacfjahgo. Before installing any application, it is important that you run a web search on your target tool and reputable sites to download it from. Basically, we suggest that you always use official pages for downloading software and updates; however, it is worth checking out the application even if it has an official page because you may find out that it is a potential threat that you should delete from your system just like in this case. Usually such programs that change your browser settings travel in free software bundles as well. We cannot claim yet that this PUP also uses this distribution method as we have not found such samples, but it is still a possibility. This is why it could be helpful for you to know how it is likely to end up with a software bundle on your PC that may contain PUPs as well as malicious threats like adware apps, Trojans, browser hijackers, and more. Unfortunately, most of the time it is you who lets these threats onto your machine. It is enough to click on the wrong third-party content on the wrong site, or download free software from a shady torrent or freeware page, and you could infect your system in no time. Yet another option is that your computer was previously infected with adware or a browser hijacker that displayed the unsafe third-party ad or link that you clicked on to download the bundle or to end up on a malicious page that dropped it. All in all, we recommend that you do not just delete Shielddefense.net Redirect from your system but also, scan your PC with a trustworthy online malware scanner to detect all other potential threats. This PUP forces your Google Chrome browser to redirect your homepage, new tab, and default search engine to shielddefense.net, which is its own search engine indeed. As a matter of fact, this questionable tool is so pushy that you cannot even change these settings as you wish; well, not until you remove Shielddefense.net Redirect. This tool promises you safe browsing by informing you about the ranking of the page you are about to visit from being totally safe to being malicious. This would, of course, come in handy if it is all reliable. Well, we cannot claim otherwise. Still, the fact that this extension promotes a questionable search engine that is virtually forced on you is definitely not a good sign. 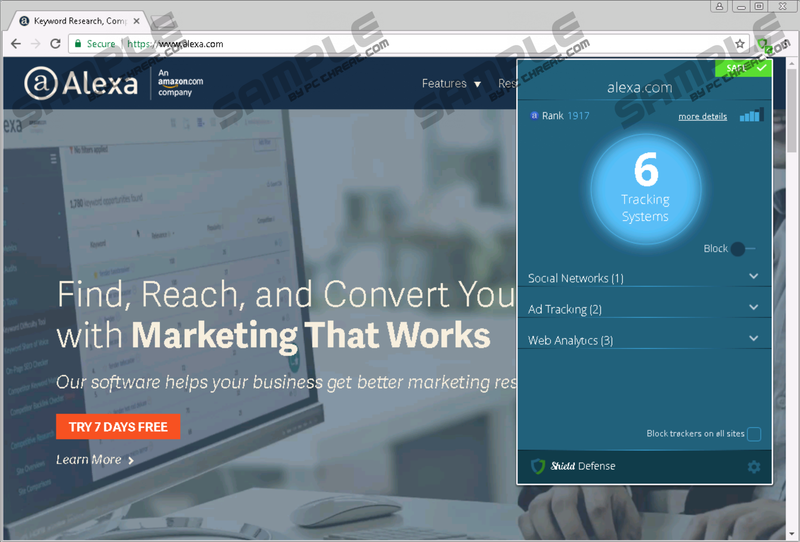 In fact, this search engine might expose you to manipulated search results including promoted affiliated websites and links. Running a search using this tool redirects you to a Yahoo search results page, which may misleading you into thinking that you are on a secure page. However, since it is possible that this page contains content from questionable third parties, you might get redirected to websites run by crooks. This may result in online scams and you could lose money or worse, your personally identifiable information as well. We believe that should be enough for you to want to remove Shielddefense.net Redirect from your computer. However, this is all up to you and how you see this PUP. In order to eliminate it from your browser, you need to remove this unwanted extension and that should restore your homepage, new tab, and default search engine settings in your Google Chrome browser. This is the only way for you to have your preferred settings back. Please use our instructions below this article if you want to do this manually. However, if you are looking for a more efficient way to defend your PC against PUPs and malicious threats as well, we advise you to install a reliable anti-malware appliation (e.g., SpyHunter) that can automatically take care of the protection of your system. Press Alt+F to open the menu. Locate this unwanted extension and click on the Trash can icon. In the confirmation window, press Remove. Quick & tested solution for Shielddefense.net Redirect removal.